Love, beauty, elegant, and romantic are but a few words used to describe the Iguana rose. Having a truly unique stark terracotta color, the iguana rose will be a sure hit. 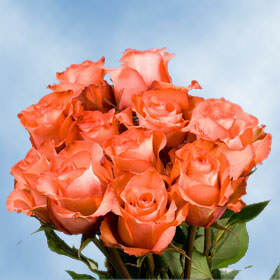 A unique specimen, the Terracotta Rose can add true originality to your floral arrangement. Guest of your next event will be mystified and entranced by the beauty of this rose. 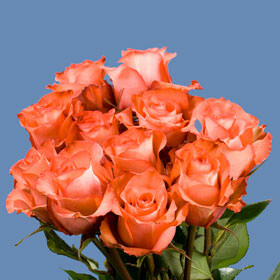 In a centerpiece it is sure to blend splendidly with any adjacent flower. Well suited for birthday parties, mother's day dinners, and weddings. Our Terracotta rose floras are grown in accordance to some of the highest environmentally friendly standards in the industry. We love nature as much as we love our roses and saving you money. We have partnered up with FedEx to give all of our continental USA customers free shipping. FedEx is known for quick and hasty deliveries. Our greenhouses are located in some of the sunniest parts of Colombia so that we can grow all year long. Every single day we are open to provide the most excellent flowers nature can provide, whenever it is you may need them. Your order will arrive at your doorstep as fresh as nature intended. They will only need two to three days to fully bloom into a magnificent bell shape. Please enjoy the flowers!